Complimenting the firm’s existing offering of a fixed chamber round baler wrapper combination, John Deere is introducing a ‘combi’ version of its variable chamber 900 Series round baler. Developed in partnership with Austrian firm Goweil, a specialist manufacturer of bale wrapping systems, the G5040 Kombi Ready option is available to order with any 900 Series variable chamber round baler. 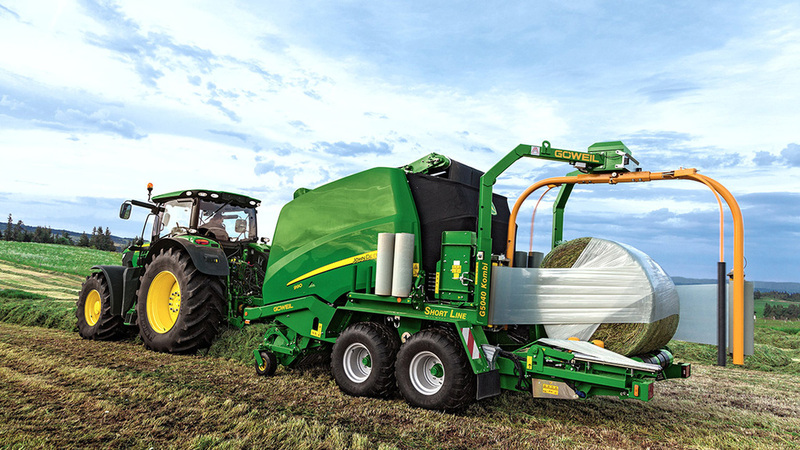 Goweil manufactures the wrapper and chassis into which the baler is fitted by a John Deere dealer. Minus its own axle, drawbar and bale discharge ramp, the combination baler employs the same Fast Release System (FRS) as a normal 900 Series baler, allowing fast bale ejection in less than five seconds, says the manufacturer. This is enabled by a ‘curtain’ design which replaces the traditional heavy door. It is claimed the wrapper can keep up with the baler. The combination can also carry enough film wrap for a full day’s work, says the manufacturer, 12 rolls in total. The 960 and 990 round balers are available with a choice of 2.2m wide RotoFlow or MaxiCut 13 or 25-knife pre-cutter pick-ups, and produce bale diameters from 0.8 to 1.6m and 0.8 to 1.85m respectively. Balers are also equipped with a drop-floor unblocking system which operates over the total width of the rotor.